Join a unique horseback riding vacation in Sicily, an island off the coast of Italy in the central Mediterranean Sea. On these riding holidays, trek through the stunning environments of Mount Etna, the tallest active volcano in Europe and one of the most active in the world, the stunning Madonie Mountains and Nebrodi Mountains. In June 2013, Mount Etna was added to the list of UNESCO World Heritage Sites. These Italy horseback tours are available year-round and many include popular inn-to-inn riding vacations, exploring quaint B&B's, country homes and even a shepherds hut in the mountains. From February to November, ride Sicilian horses to discover the amazing Madonie, Nebrodi and Etna Volcano National Parks with the history, traditions, people, ancient horse culture and the incredible food of Sicily. Come in July and August to discover the Madonie Park, staying in two different country houses with swimming pools. In September, participate in one of the oldest Pilgrimages on horseback in the world, which attracts riders from all over Europe. These Italy horseback riding vacations offer scenic diversity with routes taking you through forests, up and down mountain tracks and across open countryside. The Madonie Mountains are called the “Dolomities” of Sicily for their sharp and rocky carbonate limestone. They have the greatest bio-diversity in all of Italy. The woodland and mountains are home to deer, wild boar and wildcats, golden eagles, peregrine falcons and colorful wild flowers. Contrasting them are the Nebrodi Mountains, which are soft and round, full of natural lakes and ponds, and almost totally covered by ancient forests of beech and oak. Mount Etna offers a distinctive natural environment with craters, ancient and young lava fields, grottoes, forests of beech and birch, lots of endemic plants, and more. On these Sicily equestrian vacations, visit ancient villages in the mountains, many of which were founded by the Greeks, Arabs, Normans and Romans. There are castles, cobblestone roads and ancient historical centers that can be visited on horseback. You'll experience authentic Sicily, where farmers still herd cows, sheep and goats on the hills and make delicious homemade cheese and olives are cultivated for oil and fruit, and grapes for wine. Sicily has the most historic and rich European horse culture, which you’ll experience on these vacations. Before the discovery of America, Sicily was the “Centre of the World” and today the island is full of the remains and vestiges of this ancient and rich history, tradition and culture that comes from the Sicani, Siculi, Phoenicians, Greeks, Romans, Arabians, Normans, and Spanish. 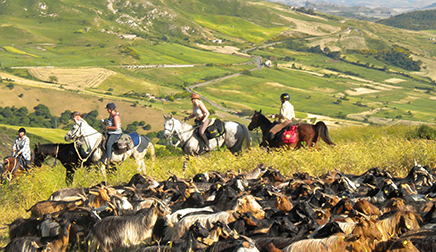 These Sicily riding holidays offer you deep Sicilian experiences on horseback as you discover what comes from the past and the natural wonders of the amazing mountains protected by the Natural Parks of Madonie (The Dolomites of Sicily), Nebrodi (the Green Sicily) and Etna Volcano (the Volcanic Sicily). Franco, Paolo and Giuseppe run these trips, offering their friendship and knowledge about horses and Sicily, to give you an amazing, memorable experience. On these riding vacations, you will be crossing mountain areas at heights of up to over 6000 feet, 1880 meters. It is mandatory for all participants to have the following personal equipment. Please note that in July and August, rain is very rare. - Rain/ wind gear with rain /wind jacket. - shoes: We suggest not wearing any kind of long riding boots. We do suggest short riding boots or paddock boots with short or long chaps. No running shoes or sneakers. - Ear plugs (Sleeping in countryside or nature, night noises may include wind, rain, storms, lightings, barking dogs, snoring from your room partner, early shower from other riders in other rooms, etc., so if you are a light sleeper, bring along ear plugs. Personal baggage will be moved by car. There are no weights limits on your baggage, but packing lightly and practically is always best. Helmets are mandatory on this riding vacation. We strongly suggest bringing your own helmet. If you do not have a helmet, one can be rented at 25 € per person per trip. Payment can be made on site prior to departure, but you must let us know in advance, so we can reserve the right helmet for you. Please let us know your size in centimeters. We ride in high mountains above 800 meters, reaching 2,000 meters on Etna. So until the end of June /mid July, the temperatures up in the mountains is nice and not too hot. Between the coastline and the mountains can be 10° difference. June and beginning of July are very nice and temperatures are mild. In October and November, the weather is very good, not cold, not hot, no bugs, little rain. In February / March in the Madonie, we normally have very mild temperatures and sun with a couple of snow storms that deposit snow in the high elevations. The horses you'll ride are trained with the Gentle Horsemanship method of the “Six Keys of Harmony” from well-known U.S. trainer Ed Dabney. Franco and Paolo, the owners, studied at Dabney’s US Ranch. The horses are all Sicilian Indigenous breeds, including the Sanfratellano Horse, which is runs wild in the Nebrodi mountains, and the Sicilian Pure Oriental Horse, of which there are only 191 left. Their stud book dates from 1876. These are the some of the best endurance horses in the world! The horses live year-round outside and get to be horses. They are not kept in stalls. They like to be ridden with a light rein, hands and legs. Handmade in 2013, you’ll ride in identical trekking saddles with a front strap and crupper, huge waterproof saddle bags to assure the maximum of comfort for the horses and to allow English and Western riders to go up and down in the mountains with a saddle that never moves and with all the gear you need. Your luggage will be transported for you each day. Basic grooming and all saddling/unsaddling is done by the guides. Before departing, you will be shown how to prepare your horse to be quickly unsaddled by the guides and how to prepare the horse for picnic stops. Riders have to clean their snaffle bit at end of the day, loosen their girth at end of the day and the feet of their horses in the morning. Guides groom very well only the areas where tack will go on. Riders may opt to clean/groom their horse if they wish before departure. History, beautiful beaches (beach horseback riding is available upon request for custom vacations), archaeological sites, natural areas, good food, wine and cheese and special traditions abound in Sicily. There are many activities for non-riding guests, including guided tours in the area and in the national park, hiking, sight-seeing and shopping or just relaxing with a good book in this Mediterranean paradise. Near Madonie is Palermo. You’ll have a short tour of this historic city during the transfer from the Palermo Airport. Other great places to visit include Cefalù and Castelbuono with its monasteries and churches and the amazing Ventimiglia Castle, where there was a historic horse academy, the “Academy of the Star”, with the best horse trainers of the Empire. Etna, Petralia Soprana, Capizzi and other destinations of historical and cultural significance abound. In addition to riding, enjoy Biking, Bird Watching, Cooking Lessons (including pasty making), Photography Lessons, Six Keys of the Harmony of Horses, Sea Fishing, Golf (nearby), High Speed Internet, Spa, Wine Tastings, Hiking, Horseback Riding, Sight-seeing Tours. Stay in 3 and 4 star Country Houses (agriturismos). This riding tour is based in the Madonie Park not far from the historic town of Cefalù. The Country Houses have been hand selected by owners Franco and Paolo for the quality of their services, location and the overall quality of their food. Some of them have a swimming pool and one has a very good Spa. While some have cozy rooms, others are more simple, but all are clean and comfortable. All rooms have their own private bathroom with hot showers. You'll change accommodations every night during the treks, as these are progressive riding vacations. During July and August Ride & Stay Weeks, there are only two accommodations used. Masseria Rocca di Gonato is situated 3280 feet (1,000 meters) up in the Madonie Natural Park not far from to the village of Castelbuono, rich in history and monuments. The country house was restored from an ancient farm that was part of a medieval Monastery. It is surrounded by oak woods facing the valley of the Gonato River. Hotel Pomieri is nested on a dominating hill in the middle of the Valley of Pomieri oak wood, dominated by Mount Pizzo Canna and Mount Ferro. It is a big Alpine chalet set alone in a pretty valley near a few scattered shepherds’ huts. The views are stunning and Hotel Pomieri is very well known for its restaurant. Piano Farina Shepherd’s Hutt is an ancient shepherds work place that was entirely renovated and enlarged to host visitors for lunches and dinners. Learn how local cheeses are made and spend the night in comfortable camp beds with air mattresses, pillows, linen and sleeping bags, enjoying a unique mountain experience. Top level cuisine with four-course dinners including wine. Franco, as a seasoned travel journalist, and Paolo, an ex-chef and pizza expert, know exceptional top local products and good Sicilian mountain food. All menus give you the opportunity to taste a wide variety of the best dishes of the “infinite” Sicilian mountain cuisine. Feast on fresh vegetables (many collected seasonally in the wilds of the park), local cheeses, modern or traditional pasta dishes, a huge variety of local meat dishes with pig, beef, veal, or chicken grilled, barbecued, roasted or cooked fresh. For vegetarians, there are splendid menu options thanks the huge varieties of Sicilian dishes without any meat. All meals are homemade without preservatives or any industrial additives. At end of your four course dinner, try Sicilian desserts–– very popular with travelers. The wine is also very good, including local reds (whites on request) to accompany lunch and dinner. Travelers seeking great Italian food, culture and a mix of riding in nature with villages will like this riding vacation. Travelers who want an inn-to-inn Italy riding adventure will like these treks. During July & August only, we offer a one week-long stay that includes nights in the Masseria Rocca di Gonato Country House combined with a two day pack trip into the mountains. This riding vacation is perfect for travelers that want a full summer holiday on horseback, plus a two-day riding experience in the high mountains. Single rooms: Because of the nature of the accommodations, single rooms are not always available. Should you request a single room, the cost per night is 25 Euros and this can be paid at the end of the trip in cash. 5 nights at Masseria Rocca di Gonato, 1 night in Pomieri Hotel and 1 night up high in the mountains in Piano Farina Shepherds hut during a minitrek. Riders can enjoy horse rides along the trails in the Madonie Park then a type of pack trip, riding two days for around 5 to 6 hours daily in the heart of Madonie Park sleeping one night in the comfortable Hotel Pomieri and one night in renovated shepherd hut on comfortable camp beds with a barbecue dinner. Riders must be able to go at walk, trot, canter and enjoy short gallops without issues and also trek along curves, which are sometimes sharp. Riders must be able to ride for 6 hours a day. This riding tour is only for advanced beginners / intermediate and advanced riders with a good degree of fitness in the saddle. No beginners. The mini trek will takes riders in the heart of the Madonie Park, up in the mountains of Mount Madonna dell’Alto. As an option, there can be one night also at Marini Hotel in order to have one more high mountain ride to reach Carbonara Top. This will be decided with riders before the departure of the trip or second day. When not on horseback, riders may enjoy the swimming pool when in Masseria Gonato. This riding holiday offers a gourmet culinary experience on horseback. All dinner menus and restaurants were specifically chosen to give to riders a top Sicilian food experience. All recipes are made with local products. Only very fresh local vegetables, meats, cheese, wines, and breads are used. Even the mineral water comes from the Madonie Mountains and Etna volcano. All dinners have four courses: appetizer, a pasta dish, main course, dessert and /or fruit. Local red wine and mineral water (or spring water) are included. Breakfast: continental breakfast, juice, croissants and cakes (where available). Those who prefer a savory breakfast with boiled eggs or cold cuts and cheese need to just let us know in advance. Picnic Lunch. All picnic lunches are cold with local fresh bread, meats, cheeses, typical Sicilian products like olives, dried tomatoes, mushrooms and greens with olive oil, fresh tomatoes and salad, fruit. Menus change almost every day. When the minibus cannot reach riders at lunch time, riders will enjoy good sandwiches along the trails. Drinks included at picnic lunches: water, local red wine and Diet or Zero Coke. On this riding vacation, riders normally ride for 2 to 3 hours on horseback in the morning and 2 to 3 hours in afternoon. Transfer from airport to Masseria Rocca di Gonato. With a garden and a seasonal outdoor pool, Masseria Rocca di Gonato is a lovely renovated monastery featuring a restaurant and wellness facilities. Enjoy a siesta or swimming pool, dinner and your night in Masseria Rocca di Gonato. Breakfast, morning ride, picnic lunch, return to Masseria, siesta, afternoon ride, dinner / night in Masseria Rocca di Gonato. Breakfast, visit of Castelbuono Castle on horseback, picnic lunch, siesta, afternoon ride, dinner / night in Masseria Rocca di Gonato. Castelbuono Castle, locally known as Castello di Castelbuono or Castello dei Ventimiglia, is a 14th century castle mixing Arab-Norman architecture that lies in the town of the same name, in the Palermo province of Sicily. Breakfast, Morning ride, picnic lunch, siesta, afternoon ride. Dinner and night in Masseria Rocca di Gonato. Breakfast. Departure for the mini trek into the mountains. Picnic lunch. Dinner and night at Pomieri Hotel. Breakfast. Ride up to Madonna dell’Alto Mount and Monastery (1870 m). Picnic lunch. Dinner and night at Piano Farina Shepherd hut. Religious buildings including abbeys, monasteries, convents and churches, are scattered throughout the Madonie Mountains. The sanctuary of the Madonna dell'Alto, dating back to the 14th century, is a religious site for people from the adjacent villages and small towns located high in the mountains. Barefoot pilgrims make a trek here several times a year. Non religious tourists visit to enjoy the beautiful landscapes, the healthy air and the wonderful panoramic views over the mountains and Sicily. Breakfast, Cheese making at Shepherd hut, cheeses tasting. Short excursion to Pizzo Canna, a stunning locale in the mountais to take photos, lunch, arrival at Masseria Rocca di Gonato, swimming pool. Dinner and night at Masseria Rocca di Gonato. Silence and tranquility are the ingredients of these three accommodations. On this riding vacation to Mt Etna, you'll spend around six hours a day riding for six days. Riders need to be more fit then the Madonie trek in July and August because trots and canters are longer than on Madonie. There are not difficult or technical passages. Trails are wide and with good soil almost all over. If weather conditions allow, you will reach over 6500 feet (2,000 meters) of altitude on Etna volcano and cross on horseback the 2002 eruption area. It is a very scenic mountain trek with astonishing views all over. With good visibility, you'll see from the Eolien islands to Etna volcano almost all along the second part of itinerary. You'll ride through different natural environments that are best visited on horseback as they are remote and cars are not allowed. To optimize the itinerary, you'll sleep one night in a Forest Service Refuge on east Nebrodi Park close to Lake Tre Arie. Better accommodations are really too far away. The trip crosses three wide natural Parks: Madonie (the Dolomites of Sicily), Nebrodi and Etna, on UNESCO's World Heritage List. 96% of the ride is on trails, 4% is on asphalt. The short pieces on asphalt are close to the accommodations, which is why you'll need ride on asphalt. Riders must be able to ride at walk, trot, canter and gallop for long stretches. Riders must be able to ride for 6 hours a day. Riders with problems in their knees or backs or in not very good general physical condition are not good candidates for this trip. This vacation is for intermediate and advanced riders with a very good degree of fitness in the saddle. No beginners or advanced beginners. Program can vary depending weather conditions, trail situations, orders by Park / Reserves Directors, and hotel occupancy. After arriving, you'll be transported about two hours by minibus to Masseria Rocca di Gonato Country House. If possible, depending on the time of arrivals, you'll enjoy a short tour in the Catania historical center and a light lunch with Sicilian traditional fast food (cost not included in the package). Gourmet Dinner and night at Masseria Rocca di Gonato. With a garden and a seasonal outdoor pool, Masseria Rocca di Gonato is a lovely renovated monastery featuring a restaurant and wellness facilities. The swimming pool is available in the summer. SPA and Massages Service available on request all year round. Horses are hosted tonight in the pasture in front of the country house. From Masseria Rocca di Gonato, follow a trail into the mountains in front of the lodge. Then we'll need to ride on about 2 km of asphalt that cannot be avoided to reach the pass of Portella Mandarini. Next, follow a very ancient trail (most of this trail was designed by the Romans after they built Petralia Soprana village, Petra Lileum), the second part is cobblestones from when the Romans built this trail as a road (all original roman's stones of that ancient road disappeared). Enjoy a picnic lunch in a Forestry service wooded area, where the minibus will meet us. In afternoon, follow a long and ancient shepherd trail along the last hills of Madonie to reach a pool where the horses can enjoy a nice drink. After the crossing of a huge pasture along trails created by the cattle herders, we'll need then to follow asphalt for around 1 km, then a trail in the hills with fields along the side of a road to reach Villa Rainò country house, close to the village of Gangi and offering an outdoor pool and panoramic views of Mount Etna and Parco delle Madonie. Follow the dry bed of a river (water only in winter) to reach the asphalt road that leads up to the trail that crosses a Wind Turbine park. That asphalt road cannot be avoided and gives the horses access to an important water pool to enjoy a drink. The large and long trail along the edge of the mountain will be done mostly at canter/gallop. This will be followed by a trail that crosses the Natural Reserve of Sambuchetti – Campanito, an oasis of woods that give shade almost all along the entire way. Stop for a picnic lunch before exiting the Reserve. Next, ride through the most typical Sicilian countryside to reach La Perla di Pancallo country house and riding centre. Immediately after the Reserve, we'll ride the “Regie trazzere” or King’s Road, built by the Spanish in the XVIII century. These dirt roads were large and used to move travellers, cattle, sheep and goats during their switch between summer and winter pastures and locations. Most of them were reduced in size or disappeared because land owners destroyed them to enlarge their properties. Ride up to reach the mountain divide of the Nebrodi Mountains. We will need to trek along a little pavement when leaving La Perla di Pancallo and after that we'll only ride along. Enjoy a picnic lunch with sandwiches in a very scenic location. Then cross a valley, a river and ride up to the mountain divide. The rest of the day, you'll ride into the woods amid old beech trees. Follow the divide amid thick shaded woods and wide open spaces with stunning views. The horses will stay close to the mountain pass during night in an electric fenced corral around a water source with one of the guides sleeping with them. Riders will be transferred by minibus (6 minutes drive) to the hotel. To reach the corral, you will need to ride along pavement for about one kilometer. This is the day of Lakes. One after the other, we'll pass Maulazzo, Biviere, Cartolari, and Tre Arie natural lakes. All of them are unexpected finds amid the Sicilian landscape. The trail rises along the mountain divide with landscapes similiar to the Eolien islands and Etna volcano. Along the trail, we may come across “Sanfratellano’s horses” and “little black pigs of Nebrodi”, both roaming free in the mountain pastures. Today the lunch consists of a picnic with sandwiches because it is impossible for the minibus to met the group. After long trots and canters, at end of day, reach the Tre Arie Refuge of the Forestry Service (Azienda Foreste Demaniali). The refuge has kitchen, three bathrooms, a hot shower, one dining room and two sleeping rooms. All rooms have a big fireplace. Riders will will sleep in two rooms in comfortable camp beds with air mattresses, linens, pillows and sleeping bags. Hot showers can be done one by one and only before dinner, not in the morning. We will provide a towel for each rider. A gourmet pizza is cooked in the wood oven in the refuge and riders can choose between six different toppings for their “gourmet pizza in the middle of wilderness!" It is an extraordinary experience of full immersion in nature. Those who wish can help make pizzas and while waiting for dinner, play cards and chat around the fireplace drinking a glass of red wine. Tongiht will be an early night because in the morning, the wakeup call is earlier then other days, at 7:00 am. You will likely be awoken by noise made by the forestry service people arriving to work. Breakfast is served inside the dining room. To day is a shorter day to give a rest to riders and horses before the last day on Etna, which will be the longest. After the minibus is packed, we will start along a scenic trail that goes down to the valley between Etna and Nebrodi to reach the Lake Gurrida Nature Reserve. From the top of a hill, the landscape of this valley with views of Etna is impressive. Lake Gurrida is a seasonal body of water filled by the waters of Flascio river that flows down in the spring and is blocked by very ancient lava fields. The reserve will be opened for us by personnel of the Forestry Service (there are gates to stop cars and people without permission). We have special permission to ride here! Inside, you'll see an area with astonishing ancient primary eruptions that is the northern limit of Etna. Here there are huge lava banks and a lava field full of “volcanic bubbles” (the guide Franco will explain this astonishing volcanic phenomenon). A picnic lunch is served before entering the Reserve. Cross the “CircumEtnea railway” and then ride up the volcano for around two hours to reach the Fucina del Vulcano Hotel, situated on the slopes of Mount Etna. The second part of day, ride along woods of mixed forests that cover the northern lowest part of the volcano. Dinner and night in Fucina del Vulcano. Horses are hosted in the electric fence corral build by us in the garden of the Hotel. The morning trail ride on this day of your Sicily riding vacation consists of a winding wide dirt road that rises up to reach a large trail that surround Etna volcano. Along the trail, you'll see various stages of lava flow and unique vegetation, including endemic plants found only in Sicily. After the Mount Spagnolo crater, which is now totally covered by woods, the trail crosses the lava fields created by a 1981 eruption that almost hit the town of of Randazzo, visible in the valley. At the very “last minute” the lava went to the right of the town stopping close to Alcantara River. Enjoy a picnic in Santa Maria refuge with good sandwiches. This is an area where cars are not allowed, as it is close to Etna volcano. Enjoy a canter and trot through woods of pines, oaks, birch and arrive to a wide trail at a junction. If weather and visibility allows, we will follow the trail on the right going up to reach the Mount Timpa Rossa crater and close by craters of the eruption from 2002 at around 6500 feet / 2.000 meters of altitude. Then, if visibility conditions allow, we will cross the craters and the lava flows of 2002 along a very narrow trail on that lavas to reach Piano Provenzana ski resort area. Then a trail in pine woods down to Hotel Ragabo, a nice mountain chalet. Along the main trail it is possible to see the low valley and the Alcantara river, famous for its Gorges. Dinner and night at Ragabo Hotel. Horses are hosted in the paddock on the side of hotel. Depending on the departure of the first flight, enjoy breakfast (possibly very early) and then transfer by minibus to Catania airport. Those with late flights can visit Catania or to ask for a private transfer by car at an additional cost. The Madonie Natural Park inn to inn riding vacation is a High Mountain Trek with 5 to 6 hours of daily riding during the late winter / early Sicilian spring in February and March, when at higher altitudes there is snow and at lower altitudes flowers. The itinerary can change a lot depending on the amount of snow, including which trail we follow and sometimes accommodations. You'll stay at hand-picked Italian inns with charm, great locations and wonderful Sicilian cuisine. It is a very scenic high mountain trek, challenging for horses and riders, with astonishing views due the very clear winter visibility and a mixture between nature and culture. You'll visit Castelbuono Village on horseback, the Ventimiglia Castle and learn a lot about history and culture along this equestrian vacation. With snow at high altitudes, there is even more adventure and fun. 96% of this Sicily riding vacation is on trails and the rest is on pavement, due to the necessity of crossing roads and riding along roads to reach some of the accommodations. Riders must be able to go at walk, trot, canter and enjoy short gallops without problems, along curves, which are sometimes sharp. Riders must be able to ride for 6 hours a day. This Sicily riding holiday is only for intermediate and advanced riders with a good degree of fitness in the saddle. No beginners. This riding vacation itinerary can vary depending on weather conditions, Park and Reserves trail closures, hotels occupancy and overall snow precipitations in the high mountains. The below outline is only a sample. Transfer from Palermo airport 1 hour and 45 minutes to Lascari. Enjoy dinner and your night at Parco di Nonna Betty Country House, located amid the hills near the picturesque park. Hear a briefing about the riding vacation, general information and the day by day itinerary. Along the upper part of Pedale woods, ride to the medieval village of Gratteri and then reach the Pass to Piano delle Fate. Here you will have to ride over about 2.5 kilometers of paved road, which is unavoidable. After a picnic down to the valley of Castelbuono, cross wide woods of oaks and the pretty countryside around Castelbuono with its lovely Manna tree. Leave the horses in a pasture around the village. Transfer just five minutes by minibus to Donjon B&B, a quaint B&B. Night in Donjon B&B. Dinner at A Rua a Fera, a top restaurant, known for its pizzas. This day's riding vacation itinerary will be decided the night before depending status of trails and snow melt. Normally, we ride the “Three crosses trail”. If it is not possible, we will choose one of the other three itineraries that it is possible to do depending snow conditions and preferences of riders. Tonight, we stay in the same place, though this, again, can change depending on the snow situation. On this day, the hotel may be different depending snow situations. Day 8: Transfer to Airport. Transfer from your hotel about an hour and 45 minutes to the Palermo airport. On this Sicily riding vacation, participate in one of the oldest pilgrimages on horseback in the world and visit Nebrodi and Etna Parks plus the Sambuchetti Campanito and Lake Gurrida Natural Reserves. This pilgrimage is increasingly popular. Last time they were 740 participants coming from all over Sicily with their best mounts and tack, riding horses of every breed and even on some mules and donkeys. The trip starts from Villa Rainò to match the date of pilgrimage with arrival and departures. The trip is of medium difficulty. There are some long trots and canters. It is for intermediate and advanced riders but also “advanced beginners” can participate. This Sicily riding pilgrimage can vary depending weather conditions, trail situations, Park / Reserves decisions. After arrival and airport pickup, riders are transported 1.5 hours by minibus to Villa Rainò Country House. Gourmet Dinner and night at the country house, which offers an outdoor pool and panoramic views over Mount Etna and Parco delle Madonie. Follow the dry bed of a river to reach an asphalt road that leads up to the trail that crosses a Wind Turbine park. That asphalt road cannot be avoided and gives the horses an important water source to enjoy a drink. The large and long trail along the edge of the mountains where the wind turbine park lies will be done mostly at canter/gallop. Follow the long dirt road that cross the Natural Reserve of Sambuchetti – Campanito, an oasis of woods that gives shade almost all along the way. A picnic lunch is served before leaving the Reserve. Then we travel down the most typical Sicilian countryside to reach La Perla di Pancallo country house and riding centre. Immediately after the Reserve we will follow “Regie trazzere” or King’s Road built by the Spanish in the XVIII century. These wide roads were used to move travellers, cattle, sheep and goats during their relocation from summer to winter pastures and vice versa. Most of them were reduced in size or disappeared because land owners destroyed them to enlarge their properties, so it's a special route for us. Gourmet dinner at La Perla di Pancallo. After dinner: back to Capizzi for the ceremony of bread and wine of Saint Antony from Padova in Capizzi and statue of the Saint taken down from altar. At end of ceremony, transfer by minibus to Perla di Pancallo for the night. Early morning breakfast at 5am and transfer by minibus just 15 minutes to meet the horses. At 6am, ride from the church of Saint Anthony from Padova to Piano Cannella, about 3 hours, with other local riders. Spend some time in the mountains with crowd of pilgrims, enjoying an outdoor barbecue with a family of local shepherds, a siesta, and then return to Capizzi on horseback with all the other riders. Participate in a parade on horseback along the village’s road with locals viewing the procession. The horses will be left in Capizzi and we'll transfer by minibus to Perla di Pancallo for dinner and night. Ride up to reach the mountain divide of the Nebrodi Mountains. This will require riding on a little asphalt leaving La Perla di Pancallo, but the rest of the day, you'll ride on trails. Meet the minibus for a picnic lunch in a scenic location. Then cross a valley, a river and then up to the mountain divide. Ride into woods of old beech trees. Some parts of the ride up to the mountains are without trails, traversing open mountainsides with wonderful landscapes. Follow the divide amid thick shaded woods and open fields. Reach the only water pool in the area, which isn't always full and then ride again into the woods to end the day. The horses will stay in an electric fenced corral around a water source with one of the guides sleeping with them tonight. Riders are be transferred just six minutes down the road by minibus to the hotel. To reach this corral, we will need to follow an asphalt road for about one kilometer. Tonight will be an early night because in the morning, the wakeup call is earlier then other days, at 7:00 am. You will likely be awoken by noise made by the forestry service people arriving to work. Breakfast is served inside the dining room. After the minibus is packed, we will start along a scenic trail that goes down to the valley between Etna and Nebrodi to reach the Lake Gurrida Nature Reserve. From the top of a hill, the landscape of this valley with views of Etna is impressive. The week is a 6 day, 5 night riding vacation with 4 days on horseback, designed to give to riders around 2/3 hours on horseback in the morning, 2/3 hours in afternoon and 3 nights at Masseria Rocca di Gonato and 2 nights up high in the mountains in a Shepherds hut and Pomieri Hotel during a minitrek. So riders can enjoy horse rides in the heart of Madonie Park, you'll sleep one night in the comfortable Hotel Pomieri and one night in renovated shepherd hut on comfortable camp beds and with a dinner cooked by Paolo. The trail rides are for all levels of riders. The 2, 5 days mini trek will take riders in the heart of the Madonie Park, up in the mountains till the 1800 meters of Mount Madonna dell ‘Alto. Silence and tranquility are the everyday ingredients of these three places to stay that aren't on the typical tourist route. Thanks for a great week on wonderful horses in superb surroundings AND REALLY EXCELLENT FOOD! Rob and I want to sincerely thank you for everything on our trip, it was truly a "trip of a lifetime" for us; you and Paolo made it a spectacular adventure for all of us. We laugh at whether we learned more about horsemanship . . . Or about eating! Once home we went to the farmers market in Jackson (Wyoming) in search of fresh eggplant, tomatoes, and of course gellato. Week long horseback trips through Sicily's natural parks, including Madonie, Nebrodi and Mount Etna on well trained Sicilian horses. Horseback riding in Madonie, Nebrodi & Etna Volcano Parks in Sicily. Madonie National Park is about an hour’s drive east of Palermo. Transfers from Palermo Airport are included in the rate. From Trapani and Catania, there are small transfer fees or quick bus transportation to Palermo. Western/ English. Intermediate / Advanced for trekking. Advanced beginners welcome in special weeks during July and August. February – November for Trekking, July & August for Stay & Ride weeks. Pilgriminage trips are at the beginning of September only. Custom Riding Tours Available Year Round. Several different riding itineraries are available. Contact us for more information.